This reminded us of Geriba beach in Buzios, Rio de Janeiro, Brazil, a long strip of compacted sand that seemed perfect to jog on at any time of day. A dog or two lets you know you’re not in Florida. 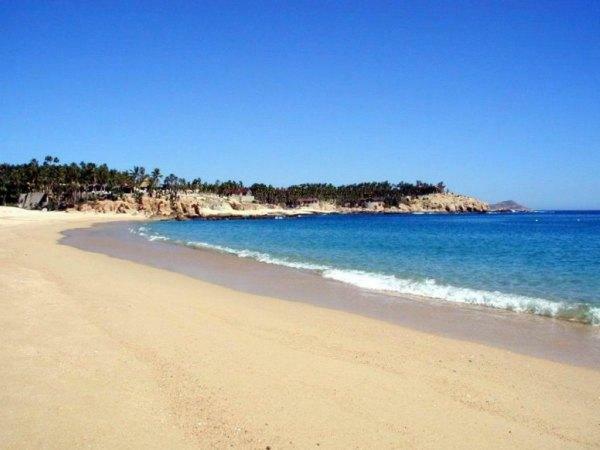 Bahia Chileno in Cabo is picturesque and inviting. A beach towel and a drink and we’re set. There are plenty of vendors in the area to keep us here for a week. The sun is shinning clear through the blue skies of Cabo San Lucas. We’ve found another gem. You won’t need any inspiration to make this beach a must visit when in Cabo San Lucas. Understand that if you come all the way out to Mexico’s Riviera without visiting the Bahia Chileno, well – you might as well say you didn’t have time to make it to the beach. Bahia Chileno (Chilean) is perfectly situated midway in the “Tourist Corridor”. Hands down the finest Los Cabos beach for swimming, diving, kayaking, and snorkeling above the best reef in these parts. The locals know it, too. Just ask and you’ll be told what area of the beach is best for the sport you want to enjoy. We did. We found the beach wide, and the surf fairly flat. Each morning you’ll find joggers from the nearby resorts. 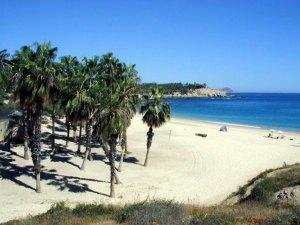 Swimming is safe – as opposed to many of the beaches we’ve reported on in the Cabos area. One side on Bahia Chileno is sandy all the way out to the reef. The other crescent is sandy but full of rock formations along the bottom, making it ideal for snorkel and diving. Underwater expect the best in colorful reef fish, sea turtles, squid, moray eels, sea urchins, those great gorgonians (sea fans), colorful sea sponges, and starfish. Look, but don’t touch. Do take an underwater camera. This beauty you don’t want to forget. There was a dive shop on the beach, but the host hotel was sold in 2005 and a new dive shop has not opened. Make arrangements in Cabo San Lucas. This beach is so easy to find. Bahia Chileno is close to the highway, around kilometer 14.5. There’s a parking area with a bus stop. Walk from the parking lot toward the ocean – you can’t miss this gem. Sand – golden to white. From coral/shell, some rock. 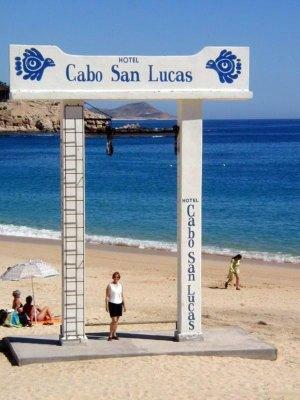 Facilities – the only beach in the Cabo area with a bathroom. BYO-paper! Sports – don’t depend on the snorkel/dive rental at the beach. Make arrangements in town. Notes – grand beach and area. Consider investing in a home here.